The Retired Hippie: Pictured below is my mom. I kept the wild and crazy pics private, for her sake lol. 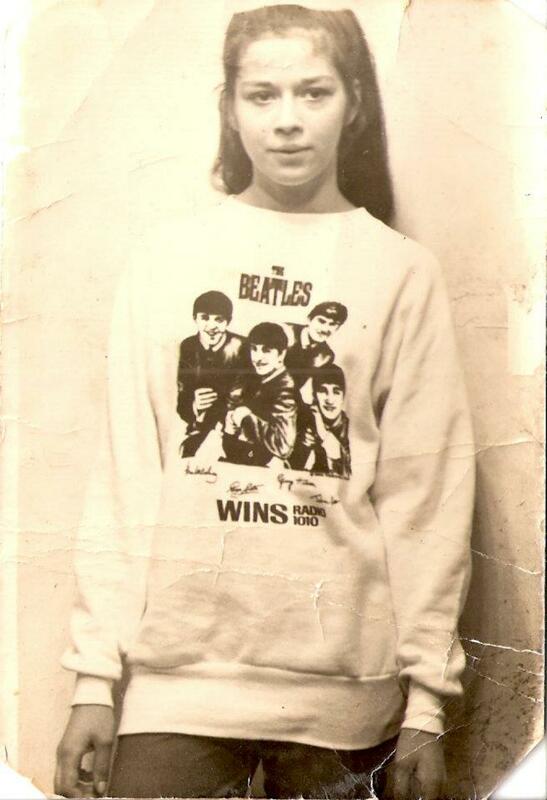 This was taken in the Summer of 64 in Brooklyn New York and she was sporting her Beatles shirt. My mom was a Hippie, then she went to college, then she joined the FDNY. She is now retired to the mountains of Western North Carolina. She has chosen not to continue the legacy for some time now. I am not saying that she does not get caught up in a song on the radio, but she is not rocking day and night. She is a retired Hippie. You say “once a Hippie, always a Hippie” and that may be the case for you. Or maybe she still is. Who knows what she is up to nowadays. The Relocated Hippie: Hippies come from many different areas and they are still Hippies. Does it mean they are homeless, or jobless, or that they “got some weed” .. I think not. Dreads? Maybe, maybe not. New York City, San Francisco California, Austin Texas, Portland Oregon are some areas you may see those of the Hippie tribe. Asheville is becoming Hippie City USA. Many relocate here. The Neo Hippie: Evolution hits all areas of our lives and things change, many times for the better. The new generation of Hippies you will find around Asheville are of many shades. Think about a joint, a dread, some funky music, some great beer, peace, some hipster fashion, a few tattoos, some art, a party spot, a couple piercings… mix that in a blender and that may be the beginning of the Asheville Hipster Hippie. The Local Hippie: This is sometimes a strange animal. Some of our local Hippies moved here 20-30 years ago. Some were born and raised here, and got a Hipster / Hippie balance over the years, with lots of local influence of course. Most local Hippies in Asheville are old school and cool. The Homeless Hippie: Some Hippies are homeless, just like some white people and black people are homeless. Some Hippies are Dogless. Some have a dog with them at all times. Some will ask you for money constantly, and others will be kind and your best friend for a few minutes while passing. People are different. Asheville cares a little more about their Hippie population; so it is kinda like an unspoken rule that Hippies are cool most of the time, so be nice to them and everyone else. When I was walking up Broadway the other day, I saw a gang of Hippies talking to an elderly couple. I watched for a minute and the couple crossed the street toward me and asked “Are those your friends?” I started laughing and asked what happened. The lady said “The tried to take my food. They were blocking the sidewalk and told us that we had to give our food (leftovers in a box) to them.” We all laughed about the situation and went our separate ways. Some people look like Hippies, but they are really angels, I heard something like that in the Good Book. Some take showers and baths, and some are allergic to water so they cannot 😉 Some Hippies look homeless to you, and they are millionaires. 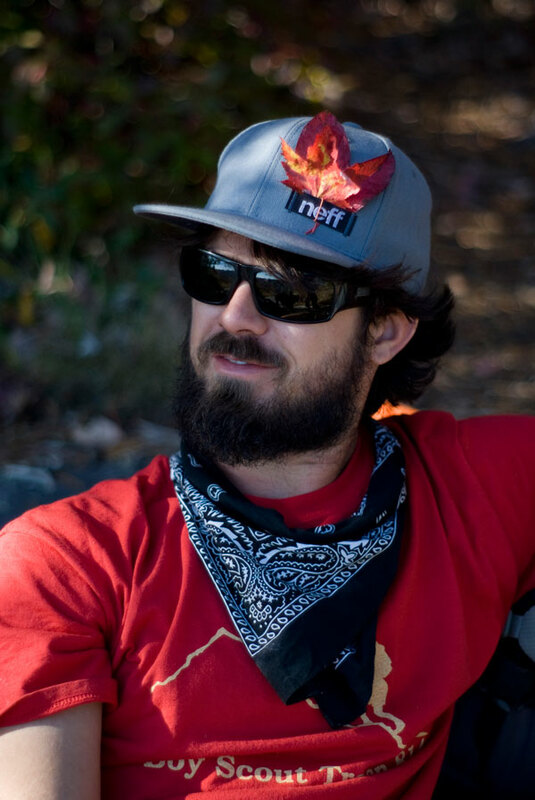 Hippies are a big part of the Asheville Beer Scene. Beer City USA and Beard City USA have many Hippie loyalists. And Hippies love that we are “Asheville – Weed City USA!” Comment after comment on Twitter about the Marijuana in Asheville being the best in the Nation, and possibly world. These Mountains have stories to tell! But when it comes down to it, a Hippie is more of a mentality and lifestyle that sought to free themselves from societal restrictions, choose their own way, and find new meaning in life. Maybe we all have a little Hippie in us. Or a lot. 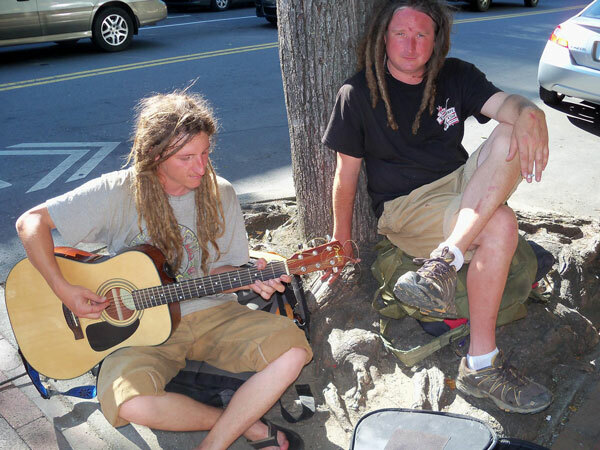 Where can you find Hippies in Asheville NC? 1. The Drum Circle: Friday nights in downtown Asheville from 4pm – 9pm and sometimes until 10pm. 2. The Patio at Tallgarys Cantina in downtown Asheville. Sit outside and get a free show. 3. Wall Street / Battery Park area, near Early Girl Eatery and Frock Boutique. 4. The Emerald Lounge on North Lexington Ave.
5. Asheville Festivals such as LAAFF and Bele Chere. At least they have soul. Peace & Love forever. 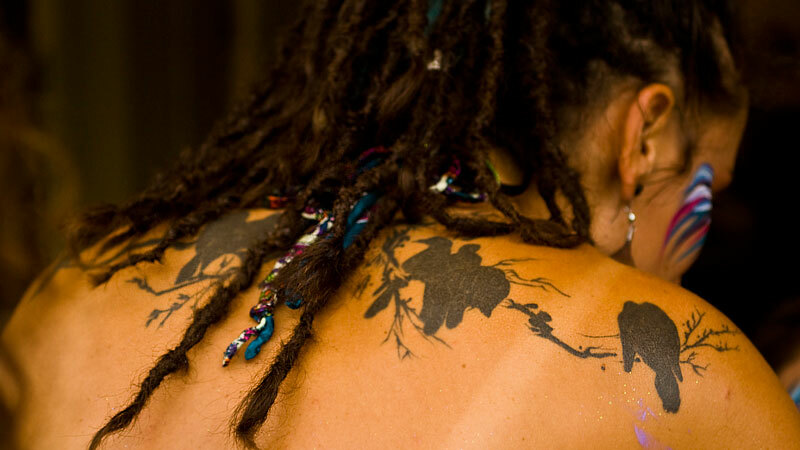 The first picture, the girl with a tattoo on her back, is our daughter Mathilda. She is no hippie. She is a working artist with a master’s degree in education. She is a homeowner. Your picture was taken and used without permission. Kindly apologize and make an offer to compensate her. Thank you. Sure, please have here email us on the contact form asap. This photo was taken in public so all rights reserved. But we can get a replacement if it is really an issue with you. Thanks. Your daughter is a skank! This may seem like a very odd question, but I thought that you might have an answer. I am a 73 y.o. musician and composer living in Charlotte. I have been thinking about coming up to Asheville for a day or two at a time by myself to play with other musicians or to busk downtown. Since I don’t expect to make much cash doing this and have a social security income, I need to have expenses as low as possible. Question: do you know of any places where I might stay that are free, barter, or bare bones cost? Camping or even sleeping in my car would be OK.
My only requirement would be safety and a nearby bathroom. Hi George! There is a hostel right above Lexington Ave Brewery and also one on Haywood Rd in West Asheville. KOA has a couple of places in the area as well. I admire Ashville and it’s people for being so open and accepting of different sub-cultures but this article, like so many others, is not right. It reflects the modern misconception that there are now different types of Hippies. Gen Y people (includes Neo-hippies, Techno-hippies, and Granola Children) are not Hippies. These people are just another generation of youngsters wanting to fit in somewhere. They may hold to some Hippie beliefs/ways but, in general, they don’t (definitely not enough to be considered real Hippies). Yunkers (drug-addicted bums who superficially resemble Hippies) are also not Hippies. So many people nowadays try to make it out like they’re “modern Hippies”. Real modern day Hippies are exactly the same as we were in the 1960’s. I guess I would fall into the Neo Hippie category just sometimes, but honestly I don’t feel I am hippie enough for this place and don’t like to smell them a half block away…..I am used to better dressed, cleaner hippies – the more pretentious type that spend a lot of time on their dreads and spend a lot on their hippie looking clothes. I at least feel that there are REAL hippies here, however. But in the end, I’m not hippie enough for this place nor fit into many of the other groups of folks from or into various cultures here, so I am headed back out West. Hippie City USA is one of our titles! You forgot the trustafarian hippies. Those that grew up in a upper middle class white family, and inherited a modest fortune from their parents or grandparents. These hippies do not work regular jobs as they retired early, and are able to use their inheritance so they may pursue their interests such as guitar, hiking guides, or pottery. Haha yes, Trustafarian Hippies should definitely be on the list! the bottom photo of 2 white boys with dreads, the one on the right appears to be suffering from pretty severe burns all over his face. If it’s from sun exposure a simple hat from goodwill would be a really good idea. Just a suggestion as it looks pretty serious. Cat, I don’t believe there is such a thing as a pretentious hippy. Or one who spends time perfecting their hair or clothes. We could care less! What your describing is called a poser hippy or pseudo hippy. Get it straight!